Have you ever wondered why building a scalable MVP is such a challenge? Hiring top developers is hard and expensive. Building a scalable solution with state-of-the-art UX requires the skill set of 4-7 people. Can you afford such a team? Even if, is it the smartest way to spend your first investment? SaaS 3.0 is often competing with Paper and Excel. SaaS 1.0 (e.g., Salesforce, Workday, Concur, Successfactors, etc.) competed with / replaced an on-prem counterpart. SaaS 2.0 often leveraged existing platforms (e.g., Marketo, Zendesk) and often sold to tech/telecom/media. Today, every business process is being SaaS-ified — and every vertical and segment. If you’re creating a vertical SaaS say, for a segment of the printing industry, your competition is often just a hacked process, not a preexisting web solution. That means the competition is often paper or Excel because there is no existing category winner being displaced. I’ve focused more on this topic in my previous article about SaaS. Let’s assume that we run one of those startups. Its competitive advantage and value proposition do not come from technology. It’s obvious to focus on your core business. On the other hand, the technology is crucial to delivering the product to customers. You can’t afford poor design or bad UX. What gives you more odds to succeed? Is it having your own team or outsourcing IT development? Some people believe that it has to be their own team. 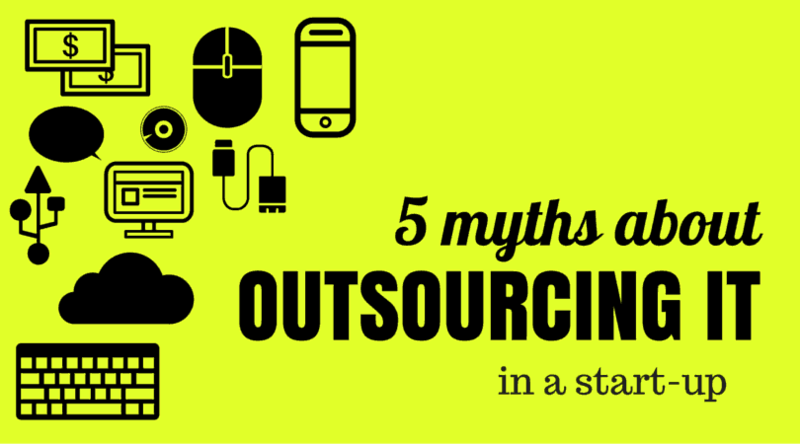 Let’s examine some common beliefs that stop founders from outsourcing! We agreed that IT is not a source of your value proposition and competitive advantage. In that case, do you want to spend 20-50% of your equity to have a CTO as a co-founder? The first version of your app is a prototype – the simplest version of a product you can build. You don’t need to implement a complex business model, scalability, nor superb user experience. Following usual best-practice, using pre-designed templates is more than enough. Your purpose is to present an interactive app which proves that you solve some problem. There’s no need to engage a rockstar CTO to deliver this. A small team of crafty developers led by seasoned scrum master is capable of doing it as well. The next step is building MVP (Minimum Viable Product). You can find out that it’s not as simple as prototyping. Your purpose here is to find the product-market fit and you need to be ready for success. Even if your prototype handles 100 users, it doesn’t mean it will handle thousands of them. When you have your MVP, you are going to look for product-market fit. You start marketing your product, new users are registering every day. Downtimes are now inexcusable. You will soon need multi-language support, you will have to implement business model and improve your UX. Still, you neither can afford a full scrum team (4-7 people), nor will you need them to support your product at this stage. The CTO of the IT company you hired will make sure that you have the right tech behind your product and you won’t pay his 6-figures salary. At this stage, you won’t need much of his engagement. Building an MVP is not an easy task. It requires skills, experience, and technology. At this level, even if you have a technical co-founder, he will need some help. Attracting top developers to an early-stage start-up is hard until you have a solid track record. There are more job offers than developers on the market and they are picky. Building an MVP costs much more than pocket-money. Very recently, I came across an interesting article written by Courtney Boyd Myers from The Next Web: How much does it cost to build the world’s hottest startups. You may check how MVPs of some of the most famous start-ups are valued by seasoned CTOs. For instance: It takes one day to code basic functions of Twitter and you can learn it during a one-day online course. But building a sustainable MVP can cost between $50k and $250k. Software development companies depend on customer success. Track record of successful start-ups is the key to getting new customers and extending the number of contracts. The whole company is set to make sure that the technology it delivers supports your business in the best way. Developers working in software companies are very committed. They work on a few projects every year using top-notch technologies. They are supported by seniors, trained and mentored. Those perks are hard to find in early-stage start-ups. They use automated CI/CD, quality assurance processes, and development tools – and they do it from day one when working on your project. It helps to build apps faster and better. It will take months before your in-house team can perform at this level. If you choose an outsourcing company wisely (to learn how to do it, read How to choose the best outsourcing company for your startup), you don’t have to worry about it. In Neoteric, we give you constant access to the team, code repository and project management tools. We also help our customers build their own team when they are ready for it. and we can even transit key members of our team to your start-up if needed. and even Github – the most used code repository. It’s true that VCs are looking for a great product with traction and a team behind it. Since the hunt for unicorns is gone, burn rate and time-to-market come into play. Outsourcing your development at an early-stage helps you in both. Your key team members are no longer developers but field experts. And the in-house development team… you can build it later when your company is ready for that. improve the quality of your product.